Here is the new installment in our traditional Windows Blu-ray player software reviews. There's been quite some development in the field since our 2011's comparison. But first things first. Nope, the year may be 2012 (and the end of the world approaching) but there are still no free Windows Blu-ray players. As explained before this mostly comes down to patents and licenses. Licensing Blu-ray technology costs money, which makes it an unlikely proposition for free media players. Laptops which feature BD drives sometimes come with OEM versions of one of the software movie players described here. But OEM versions are often lacking features and they are not updated as regularly as the retail versions of any Blu-ray / DVD player software package. Since last year Roxio stopped offering Blu-ray playback in their CinePlayer with 3D although it's apparently still marketed as a 3D player. We don't know the exact reason behind this move but it's probably something related to licensing again. And then Corel bought Roxio altogether. So currently there are just four commercial software packages for Windows supporting BD playback. These are CyberLink's PowerDVD 12 Ultra, ArcSoft's TotalMedia Theatre 5, Corel's WinDVD Pro 11 and Nero 11 Platinum. Some of these manufacturers sell also low-end packages offering cheaper video playing software with restricted functionality (like CyberLink's PowerDVD 12 Pro or PowerDVD 12 Standard), but for Bluray disc playback you will always have to purchase the high-end edition. Note that sometimes we will shorten or abbreviate the name of the reviewed 3D Blu-ray player software package but in all instances we will refer to the highest-end version, e.g., PowerDVD will stand for PowerDVD 12 Ultra. Since Nero have disabled BD playback in their trial version and it's more of an add-on anyway, Nero Platinum 11 is included mainly for completeness rather than being actually tested. Run on Microsoft Windows 7, Windows XP (with Service Pack 3) and Windows Vista. Are capable of Blu-ray 3D playback. Offer support of HDMI 1.4. Can convert 2D video to 3D. Support hardware acceleration. This means that decoding calculations are done on the graphics hardware, which enables HD video playback on systems having slow CPUs. Note that hardware acceleration will disable some video processing features because it relegates work to the graphics card driver. Work with DTS-HD audio and Dolby TrueHD audio. Upscale standard definition / low res video files and DVDs to full HD. Support AVCHD video playback. AVCHD is currently the most popular HD video format for video enabled photo cameras and consumer camcorders. Enforce content protection and will disable frame capture and clip capture (if applicable) from BDs. Other functions may also be disabled when playing content protected 2D or 3D Blu-ray discs. Support player profile 2.0 of BD-Live. Allow for several changes of the Blu-ray region code setting (usually limited to 5) inside the BD player software. Not writing the region setting directly in the drive itself uncovers a nice opportunity for turning your PC into a region free Blu-ray player: Windows 7, XP or Vista, two or three different bluray playback software packages and just one BD drive on your computer will do the trick. Our (3D) Blu-ray player software reviews continue with CyberLink PowerDVD 12 Ultra. CyberLink's PowerDVD is the oldest media player in this pack. It is also the first that introduced Blu-ray and Blu-ray 3D playback. The current version is the freshly released PowerDVD 12. In the new edition of their 3D Blu-ray player software, CyberLink have diminished the significance of the monikers TrueTheater HD and TrueTheater 3D for the corresponding upscaling and 2D to 3D converting parts of their video processing engine. In PowerDVD 12 they simply call the whole engine TrueTheater Effects. It is only available when hardware acceleration is disabled though as acceleration relies on the video card driver which is not entirely controlled by the software. TrueTheater Effects offer three notable new features. All of these are pretty nice to have for homemade videos, but we don't recommend them turned on for movies. First, there is frame rate smoothing which interpolates frames to increase apparent smoothness in movement. This is pretty nice for video, especially home videos, but don't ever turn it on for movies unless you want to make them look like TV. 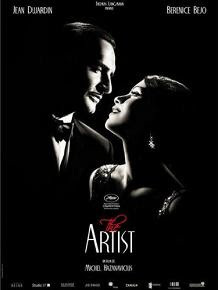 Cinema is shot in 24 frames per second, which induces the strobing effect in object movement and camera pans. Some people call it the dream effect. No reason for anyone to want to get rid of it in a movie, so, again, only use this for home videos. Next, there is a video stabilizer, which attempts to decrease image shaking from handheld cameras. Note that it will cut the borders of the video in order to manage a stable core. Last, there is a denoiser to strip videos from noise. Again, nice for home video, but don't use on movies or you will remove filmic grain from the image. As expected, PowerDVD 12 can be integrated with Windows Media Center. In this case it launches a minimalistic interface (the so called Cinema mode), which blends beautifully with WMC. This interface mode is simple, clean and designed to be friendly to remote control use, but nevertheless includes most features of the Classic mode (except files playback). Cinema mode can also be toggled on through an icon in the standard Classic mode interface. The Classic mode itself has been polished and now looks slicker. The media browser also got some new toys and now can rearrange and scale thumbnails. Scaling also extends to actual playback allowing for real time video zoom in and zoom out. In another move towards integration PowerDVD can now work and cooperate with various devices. Android and iOS devices (smartphones, tablets) can be used as remote controls for PowerDVD 12. Media files and playlists can be synced with Android and Blackberry devices. Syncing will also take care of any format conversions necessary if the mobile device does not support the source format. PowerDVD can also act as both DLNA server and DLNA client and stream from and to devices connected to the home network. Intel WiDi is also supported for wireless streaming to TVs (Blu-ray playback included). PowerDVD has always been in the forefront amongst commercial video players in terms of format support. Now in a welcome addition there is support for OGG and FLAC audio files (about time, we may say). The new Matroska 3D format MK3D is also supported. And new is support for DTS-HD 7.1 sound from Blu-ray discs. PowerDVD 12 Ultra can now also play from Blu-ray folders, a feature which was previously unique to ArcSoft's TotalMedia Theatre. An interesting move toward strengthening its status of a universal media player is the support for various picture RAW file formats from advanced photo cameras. Photo enthusiasts will probably enjoy this. Follow the link to check for a current CyberLink coupon code. 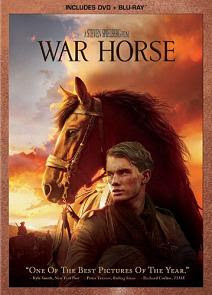 Our 2012 Blu-ray player software reviews continue with ArcSoft TotalMedia Theatre 5. Corel have released a new version of their Windows media player WinDVD since our previous Blu-ray player reviews. The company still offers two variants of video playing software: WinDVD 11 and WinDVD Pro 11, with Blu-ray and 3D support only available in the Pro edition. Corel's WinDVD lacks some of the bells and whistles of PowerDVD and TotalMedia Theatre but Corel have apparently made a serious effort with this version. WinDVD Pro 11 can now convert 2D to 3D and has updated and optimized 3D support. The processing engine has been improved with video stabilization and framerate smoothing. Both have some problems though. Smoothing introduces some weird artefacts, probably interpolation related, most noticeable around patterns in moving shots. Stabilization occasionally creates lateral jumps in the picture with the default lateral stabilization setting. WinDVD 11 also adds support for MKV, MP4 and FLV formats and for playlists. 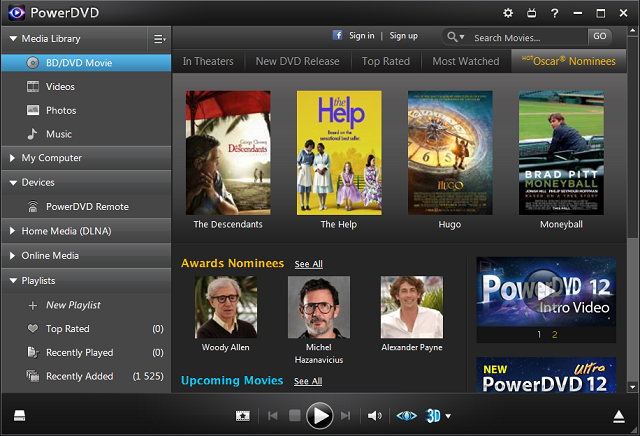 Corel now have their own online service FlixFinder, which is integrated in WinDVD. It does meta searches in movie streaming services. Currently these include Amazon, Hulu and Netflix. This allows to compare prices, select the best price and watch the movie immediately. New users are taken care of with in-software Starter Guide, video tutorials and links to a dedicated Vimeo channel. It seems with this version of WinDVD Corel have also tried more aggressively to gain market share. The list price has been lowered to $79.99 and a free copy of WinZip Pro is added as a bonus at the time of writing of this review in the beginning of 2012. The boxed version also includes a pair of 3D glasses. 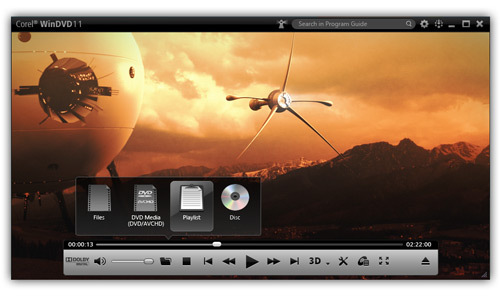 Other notable features of WinDVD Pro 11 include: uncluttered and clean interface; multitude of power management options for battery control on notebooks; a time-stretch function to squeeze in the end of the movie you're watching in limited time situations; PAL TruSpeed - an option to play sped up 24-to-25 fps PAL videos at their true speed with automatic correction of audio pitch; parental control; clip capture. Nero used to offer a Blu-ray playback plug-in for some of their applications. Things are much more simple now: in order to get BD support you need their flagship application suite Nero 11 Platinum. 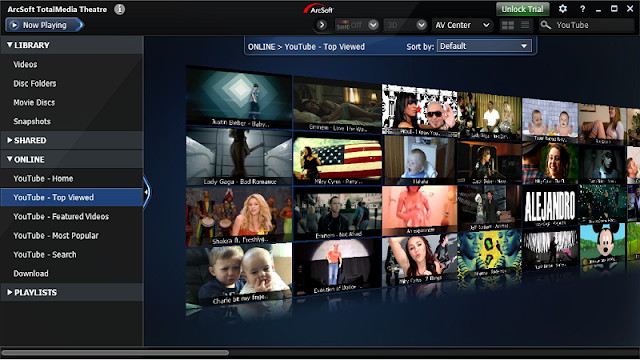 The suite includes Nero Kwik Media for media browsing, sharing on Facebook and syncing with Android devices, Nero Video for basic video editing, Nero Burning Rom for burning discs (including Blu-ray discs), Nero Recode for transcoding various media formats and ripping DVD discs, Nero BackItUp for files backup. BD playback here should really be thought of as a bonus. That is, you should be getting Nero for their other applications and not for the BD playback alone. Nero doesn't support 3D (including Blu-ray 3D), nor does it support any HD audio formats. Also, note that Blu-ray playback is not included in the free trial so you are not able to test it before buying. To confirm the trend of frequent changes in the Blu-ray software world, a new option for BD playback appeared just before publishing this article. It seems that now Nero 11, Nero Multimedia Suite 10 Essentials, Nero Video 11 and Nero Kwik Media can also play Blu-ray movies with the additional purchase of Nero Kwik Blu-ray. You can check this opportunity directly in Nero's store cause it seems there is not detailed information about Nero Kwik Blu-ray at the time of this writing. Our advice to think of Nero's Blu-ray disc playback only as an added bonus to other Nero's applications remains. But if you plan to buy one of the mentioned Nero products or already own one of them you can consider getting Nero's BD software player too cause the price for this addition won't be too high. Even if it's not as good as its competitors and you decide to buy a better video player you can still use Nero's as an option for playing Blu-rays with region codes different than your regular discs. This paragraph is here to inform that Roxio's CinePlayer that used to be a 3D Blu-ray player is currently only a 3D player. We don't know exactly why Roxio do not offer support for BD playback in their CinePlayer anymore but it could do something with the fact that Corel has recently bought Roxio. There is still 3D video support in CinePlayer with 3D, as the name suggests, so if you happen to be just after a cheap 3D video player and don't care for the lack of Blu-ray playback support too much (although why would you be reading an article comparing Blu-ray player software then? ), this inexpensive video playing program may actually be a good option. Also have in mind that Roxio CinePlayer offers RealD 3D support so it is a possible choice if you are looking for cheap RealD 3D player software too. To look for available discounts of WinDVD or Nero's products check here. Let's complete our 2012 reviews of Blu-ray playback software with comparison table and conclusion. Performance was once again tested on the computer system we used for our 2011's Blu-ray player reviews. It is equipped with Intel i5-430m CPU, ATI Mobility Radeon HD 5650 graphics video card, 4GB DDR3 RAM and MS Windows 7 OS. We actually used the same disc for the 2012's tests, so the result can be compared with last year's (bear in mind that some error of measurement surely exists). 1. Average CPU load during playback of MPEG-4 AVC stream with hardware acceleration on. 2. Average BD loading times based on 5 measurements with each Blu-ray software player. 3. Regular price; various promos or discounts may apply. Blu-ray playback quality is good with all three players. Image quality is indistinguishable between them due to decoding being done by the graphics card driver. Funnily, the problem with WinDVD we mentioned last year manifested itself again. At some point during testing WinDVD refused to run in full HD resolution and started requesting a change to lower screen resolution on startup, then quitting. From then on, this happened on each and every start of WinDVD when there was a Blu-ray disc inserted in the Blu-ray drive. TotalMedia Theatre has obviously been polished in the updates following the initial release of version 5 because there weren't any glitches whatsoever this time around. The table even shows some small performance increase, probably due to optimizations. PowerDVD got a major version update recently and this shows in occasional slight lag in the options menu. No crashes or apparent bugs though. On top of smooth playback PowerDVD 12 Ultra impressively does quick fast forwarding (also on Blu-rays) most notable when dragging the movie playback position on the timeline. None of the others can boast about that. It is worth mentioning that PowerDVD and TMT tend to get updated more often than WinDVD, which may result in fewer problems (if any) with newer Blu-ray discs. In terms of upscaling PowerDVD still looks most pleasing when software upscaling is used. It is a bit subjective, but to these eyes here this is the case. So if you watch a lot of DVDs or standard definition files it is probably best to get PowerDVD 12 Ultra. With hardware acceleration enabled the differences between all of the software Blu-ray players vanish and as already mentioned it is better to have any post-processing options in the video card driver's control panel disabled. Image "enhancements" like oversharpened picture, plasticky faces or edge enhancement may appear otherwise. It is once again a tough call between CyberLink's PowerDVD and ArcSoft's TotalMedia Theatre. On the other hand, things are simple: both are pretty good, so you can't go wrong with either. Nevertheless, we can safely recommend PowerDVD 12 to online addicts or people who like to have lots of features available, and TotalMedia Theatre 5 to the purists or anyone who finds PowerDVD's online expansion bloated. Everyone else will most likely do fine with either of them, but if you can't make a choice yet better have another look at the dedicated paragraphs: maybe there is something you've overlooked in our reviews which can help choosing the best Blu-ray player software for your particular needs. For users whose main consideration is price, Corel's WinDVD Pro 11 may be a solution although it's not considerably cheaper than its competitors and it's not as inexpensive as last year's cheapest offering in the face of the retired Roxio CinePlayer BD with 3D. This is a guest article sent to us by an anonymous user. There is nothing like listening to good old music to calm your nerves or to get you in an even more elated state than you already are in some of the most happiest moments of your life. Turning to music is one of the most primitive reactions of an average person. No one is alien to the fact, that when we feel down or saddened, our feelings are most soothed by listening to slow, soft music which usually is written on a sad note. Similarly when excited or in a party, our body craves to move on rhythmic beats accompanied by loud music. And it is therefore no wonder that romantic movies are best accompanied by some of the most popular love lyrics. But this is a craving exhibited by our body that knows no scientific laws and is therefore part of the most innate natures of mankind. Now, however, when science sees no limits when exploring in new aspects of the human brain and mind, research has unravelled the mysteries of how music really affects the brain and its psyche. So buckle up to find the true ways of how music affects our body. A new branch of health care, known as Music Therapy has been evolved after research confirmed that not only does music affect the brain's cognitive functions, it can even be used for therapeutic purposes in patients suffering from chronic to general ailments. So far experts have used Music therapy to help kids suffering from ADD, patients going through painful recovery, patients suffering from mild to chronic depression, those whose bodies are showing restricted movements and even cancer patients. Music can have a varying effect on different people and is therefore varyingly used by experts on these patients. To help understand better, let's look at what are the different effects music has on the human body. The beat of the music can actually stimulate the waves in the brain in sync with the music beat. So that the relatively faster beats, can instigate sharper thinking modes and similarly slow music can promote calmness in the brain. This ability of the music can be used to a great advantage. For instance, the brain could be stimulated to a state with the help of the music and it is going to stay there for a long time after the music has stopped. Just as the brain waves are stimulated with the help of the music, other bodily functions are also affected by listening to different sorts of music. The autonomic nervous system in the body can bring about a few changes of its own when a person listens to music. Some of the changes that it can bring are reduced rate of breathing and reduced heart rate bringing about a totally relaxed bodily response. Therefore, listening to soothing music can relieve stress. Some of the other effects that have been revealed through research and experimentation are a positive state of mind, lowered blood pressure and a general reduction in the risk of some heart diseases.